Keed’s Cottage comes from a very old tree growing at Jessamine Cottage, Pulborough, and was recognised as a variety in 1947. Keed’s Cottage is a large apple, flat-rectangular to conic in shape and ribbed along its body. The skin is pale yellow, flushed orange-red and streaked red. It has a greasy feel. The flavour is sweet and quite rich. 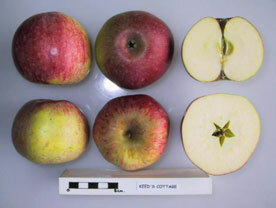 The fruit is ripe in mid to late September and can be stored until December.